Developing a partnership with a local military installation to enhance and extend service provision to sexual assault victims in the military? Learning more about military systems, protocols, culture, and on-installation resources? Discovering how to build successful collaborations, including writing Memorandums of Understanding, between community programs and military installations? The U.S. Department of Justice Office for Victims of Crime (OVC), through the OVC Training and Technical Assistance Center, in collaboration with the U.S. Department of Defense Sexual Assault Prevention and Response Office, is conducting a series of Strengthening Military-Civilian Community Partnerships To Respond to Sexual Assault training events in 2018. These local, interactive, 1-day training events are designed for community victim advocates, law enforcement officials, sexual assault nurse examiners, mental health counselors, prosecutors, military victim advocates, sexual assault medical forensic examiners, military chaplains, and military criminal investigators. The purpose of this program is to train local community victim advocates on building effective partnerships with local military installations to enhance and extend the system of support for sexual assault victims in the military. Throughout this training, participants build knowledge about military systems, protocols, and culture to improve service provision to sexual assault victims in the military and to develop an appreciation of the perspectives of their future collaborative partners. With the knowledge gained through this training process and their own expertise in sexual assault, local community victim advocates will be able to serve as knowledgeable resources to military installations. Participants will also discuss and identify strategies to form successful collaborations between community programs and military installations in providing effective services to victims of sexual assault. 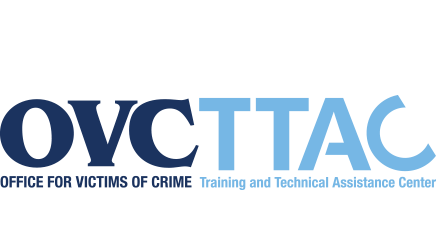 OVC's Training and Technical Assistance Center (OVC TTAC) provides training to support professional development, enhance services to the community, and expand outreach to underserved victims of crime. OVC shares your mission and has a wide range of resources to help you accomplish it. Visit the National Criminal Justice Reference Service online to register for services or to find out more.